My sister gave my husband a gift membership for Christmas. He was so excited, he hoped she would keep it up every year. My sister gave my husband, Dave, a Beer of the Month membership about three years ago for Christmas. He was so excited that he hoped she would keep it up every year. Well, she did and it makes his day everytime his shipment arrives. 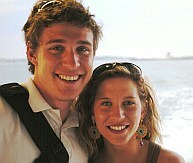 One time, he and his buddy left work early to watch a UCONN game during March Madness. The two of them were sitting there when my husband said "The only thing that would make this better is if the Beers of the Month were here." Well, unbelievably, the shipment five minutes later with his monthly supply. I've never seen such excitement! He is truly like a kid in a candy store. Keep up the good work and keep those hoppy delights coming! You guys are doing a wicked pissah job (that's New Englander for very awesome). I was never a huge IPA fan but the ones that you have been picking have really turned me on to the style. Keep up the good work and keep those hoppy delights coming! Thanks for making it Christmas year round for me, my friends and family! I have to admit that getting a new shipment delivered every month is like Christmas morning 12 times a year. I usually cherish the beer by myself or with my closest friends. I'm selfish when it comes to beer this good. However, I did decide to share my shipment with my Father-in-law! I figured what better way to get on his good side than to share a Belgian Ale from Bavik with him. We're both smiling because he got to taste one of my cherished beers and because I now think he finally likes me. 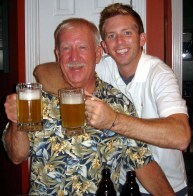 I guess I'm worthy of his daughter when I share beer this good. Thanks for making it Christmas year round for me, my friends and family! I'm not sure who gets more excited by the monthly beer delivery, my husband or our Chocolate Lab Guinness. I got the International BOTMC for my husband as a Christmas gift last year. 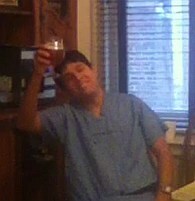 It has been quite the hit around here and he has enjoyed sharing the word by having beer tasting gatherings. 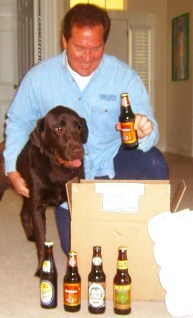 I'm not sure who gets more excited by the monthly beer delivery, my husband or our Chocolate Lab Guinness. Can you tell we like beer around here?! The delivery lady has gotten to know Guinness quite well now and has ignored the Beware of Dog doormat. He also tries to "help" me put the beer in the fridge. Thank you for so many great beers. You've made my husband very happy, you've made me Wife of the Year and you've made Guinness behave at the door (as long as it's a woman holding a box of beer). I've enjoyed your BOTMC so much, 3 years ago I added a second membership, the Rare Beer Club. I've been a member of your BOTMC for 12 years. 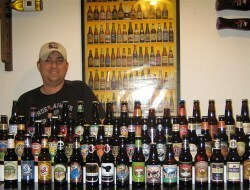 I’ve no doubt that the diverse selection of beers you've provided me helped me win the 2009 Beerdrinker of the Year Award. The annual competition is a national event. Hundreds of beer resumes are whittled down to 3 finalists. A 7-judge panel grilled myself and the other 2 finalists for over 2 hours before making their decision. The award is based on knowledge, philosophy, passion, and experiences. I have to thank the BOTMC for your contribution! I've enjoyed your BOTMC so much, 3 years ago I added a second membership, the Rare Beer Club. It’s always a treat to imbibe in specialties that are difficult or impossible to find here in the US. Thank you for the wonderful selection of beer. We are getting married this October! To pay for the wedding on our graduate student incomes, we had to make some cuts. Beer of the month club or cable television? As proud beer of the month club members, the choice was easy! Thank you for the wonderful selection of beer. Our appreciation for quality beer and the people who make it inspired us to make our own. 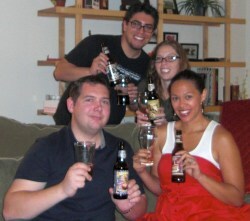 Our first home-brewed batch of amber ale was a success! Perhaps one day something we have brewed will be included in the monthly package of joy! Cheers! Thank you for bringing the love of beer into our home and bringing friendships close together. I gave this membership to my husband on his birthday a few years ago. He is a C-17 Loadmaster in the United States Air Force and often travels the world, tasting many great and different beers along the way. He has been very well known to wait on the steps of our porch while salivating and jumping up and down very excited every month. When we were relocated to a new base, my husband came up with the fantastic idea of having a beer of the month club get together with our new neighbors. Each month we taste each beer while we read about each brewery and everything about each beer. Thank you for bringing the love of beer into our home and bringing friendships close together. Cheers! Having beer shipped to my door monthly was the perfect answer. About 7 or 8 years ago, I found you online and it didn’t take long before I signed up. 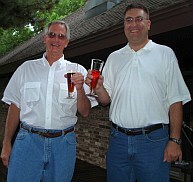 Three years before, I invited my friends to start the “Rose-Hulman Beer Club”. The premise of the club was to get together every Wednesday at midnight and split a pack of unfamiliar beer. We continued this for several years and it became increasingly difficult to find beers that we had never tried before. Enter BOTMC. Having beer shipped to my door monthly was the perfect answer. Every week, current members anxiously await Wednesday at midnight and Club Alums come back to campus. 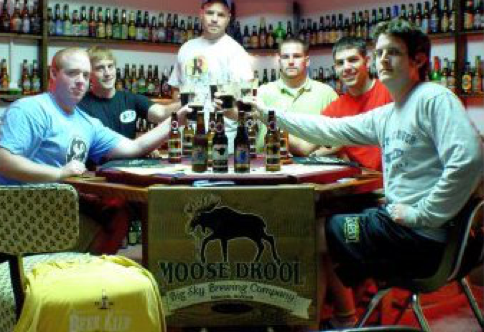 Thanks to your company, the Rose-Hulman Beer Club has withstood the test of time and has never had to settle for common beers. Thank you so much for providing such a great product. Greetings from the Paragon Innovations! 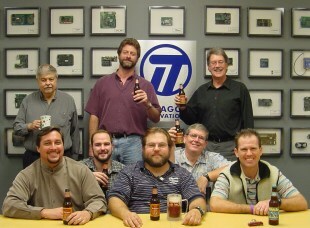 Our weekly meetings give us a chance to relax and have one of your excellent microbrews after a hard day of calculating, and to enjoy the camaraderie of our fellow engineers. As problem solvers, some of the conversations at our meetings inevitably revolve around issues such as setting up a beer chamber for optimal serving temperature, the chemical processes of malting, and even procedures for opening a beer bottle without an opener that would amaze MacGyver. We now have 10 members, with plans to grow. Thank you so much for providing such a great product.. Many of us have exotic tastes in beer and the beer of the month has still opened our eyes to new beer horizons. My daughter gave me the micro brew of the month for Christmas and I've enjoyed the beers myself and with friends. You see, many of my friends & I are brewers. We have a semiannual party...A Brew and Stew Party. 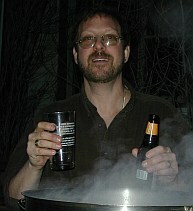 We get together and brew several batches of "beer” and a “stew" to share. So we brew, eat stew & maybe get a little "stewed". In another 3 or 4 months we have another party & share what we brewed. 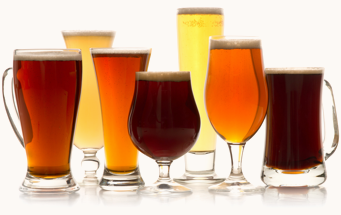 Many of us have exotic tastes in beer and the beer of the month has still opened our eyes to new beer horizons. Thanks from all of us. I was recently blessed with a membership into the BOTMC. My incredible wife had the wisdom and insight to give me 2 presents, a subscription to BOTMC, and a new Weber gas grill. Beer and BBQ baby! Does it get any sweeter than that? 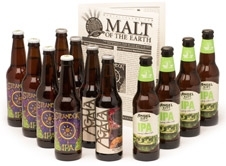 Upon receipt of my first shipment of imported and domestic beers, I not only sat down and enjoyed a brew, I also dove into "Malt of the Earth" the club newsletter. 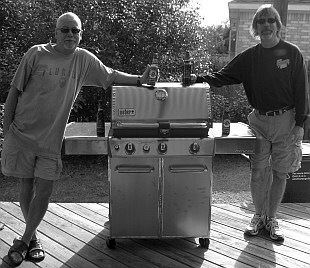 My best friend Tip and I spent an enjoyable Texas December afternoon with temps in the low 70's assembling my grill, and enjoying some incredible beer! What on God's Green Earth could be better than 70 degree temps in December? A new gas grill and Micro-Brews from BOTMC?! My bet is nothing! Prost! Yes! I just got home from a 30-hour shift in the hospital and all I wanted - I would have given a kidney for - is a crisp, refreshing beer. Lo and behold, at my doorstep is my first Domestic and Import beer of the month package, which my girlfriend got me for my birthday. I'm half asleep, but here I am enjoying an IPA I chilled in the freezer and listening to a Bill Withers album. Life does not get better! Thanks for making my day and thanks to my girlfriend for being the sweetest person I've ever met. If this is the treat I get every month, go ahead and keep me in residency forever! Thank you for providing us with an excellent product and an opportunity to establish a tradition of beer tasting with wonderful memories. My Father-In-Law initiated his membership in the BOTMC many years ago. He had macro-degeneration so I would read the newsletter aloud to him. As we sampled the beers, we rated them according to our own personal standard. 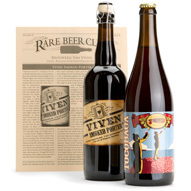 “Extraordinary” was our highest rating and typically we would immediately order a case to add to the “Stash”. 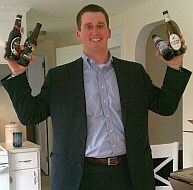 The “Stash” consisted of at least one example of each beer that we saved to share later with family and friends. When he passed away two years ago, my wife surprised me with my own BOTMC. We are reminded of him with each shipment. Thank you for providing us with an excellent product and an opportunity to establish a tradition of beer tasting with wonderful memories. All four of us now look forward to delivery days! Thank you! I was first gifted a membership two years ago by a very cool boss. Then, when my girlfriend and I moved to a new apartment shortly thereafter to be closer to work, we didn't know anyone in the local area. Lucky for us we made fast friends with our upstairs neighbors, using our monthly shipments as the ice breaker. My now wife, Marisa, and I are in the back of the picture, with our now closest friends, Sara and David, joining us in our monthly beer tastings. Thanks so much for the monthly adventures around the country that have helped us find two of our best friends! All four of us now look forward to delivery days! Thank you! I know that the three boys will all be enjoying the beer that you send for many years to come. Cheers! My husband Simon with his good buddies Joey and Jeff are enjoying this month's beer selection at our garden pub 'The Cricketer'. 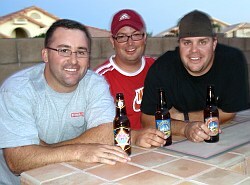 Jeff and Joey helped Simon build the bar in the garden as he's from England and misses his local pub. We called it 'The Cricketer' after his Dad Peter's local pub in Curdridge, England. Every month when Simon's beer is delivered, he puts it straight in the refrigerator and calls his buddies to let them know that it's arrived. Sometimes they even wait 24 hours before drinking it all! I know that the three boys will all be enjoying the beer that you send for many years to come. Cheers! 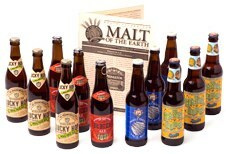 My favorite gift that I received this past Christmas is a subscription to The Microbrewed Beers of the Month Club. I was thrilled to receive my first shipment; brews by Green Flash Brewing Company and Boulder Beer Company. The thing I like best about The Beers of the Month Club is that I get to sample beers from breweries I've never seen before, beers that are not carried in my local stores. Last month I received my first BOTMC shipment as a gift thinking it was a great idea. Upon receiving my shipment, I realized it was the best gift I could ask for. Between the incredible beers and great newsletter I was blown away. After drinking the first delicious beer, I proclaimed to be a customer for life. When my next shipment arrived, I’m happy to report that my earlier assessment was spot on. Everything has been perfect. Great beer, interesting newsletters, fast and friendly customer service that efficiently answered all my questions, this is truly the best gift I've ever received. I want to thank you very much for offering a great service and a great product. Keep up the good work. I wanted to take the time to thank you for what you all do. My fiancé got me a membership for Christmas and it has proven to be the most wonderful gift I have ever been given. I have a bit more than a love for craft brews, I have an obsession. You have only made it worse. When my mom gave me this gift, she said she never heard me so excited about anything she had given me. I've been getting it for 5 months now and I'm set for the rest of the year. A very cool gift. I can hardly wait to chill them down to try each one! 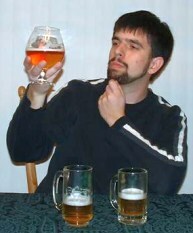 I like variety and trying new beer styles like the Saison that you sent. I didn't even know that was a style. I'm really looking forward to the next 7 shipments and if Mom doesn't pony up to renew me, I'll most likely be doing it myself! You may not believe this, but my husband has been a member of your club for two years now, and although I know he's crazy about the experience of taking his taste buds all across the country, I think he gets the greatest kick out of inviting anyone and everyone over for a beer. He has a special refrigerator in the family room which is packed with at least one of each kind of beer that he has received in the last few months. When his friends open it and see all of those different kinds of beer, they do a double take. I'm sure they all tell many stories about John's refrigerator! The Microbrewed Beer of the Month Club was a creative solution to finding the right birthday present for the proverbial 'man who has everything.' It 's simple, it's reasonable--and most importantly, it's appreciated. The brews are interesting and unique, and the stories behind the products make drinking them even more enjoyable. I gave twelve months of beer as a gift to my boss who told me every month, when the new shipment arrived, he was reminded of my gesture. 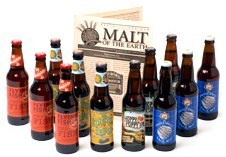 It truly is a thoughtful and sophisticated gift for anyone who enjoys drinking and learning about beer. I have worked in a brewpub that has over 75 taps and I have brewed my own beer 3 or 4 times so I'm not an expert, but I know a good beer when I taste one! 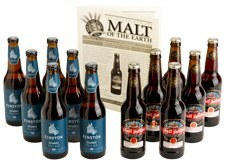 I really enjoy my monthly subscription to 'Beer of the Month Club.' If you are a beer lover you will not be disappointed. I never received a beer that was not good. And most were excellent. They always sent a great variety and were on time too! P.S. You guys sent me some really good dark beers like 'Crooked River Robust Porter' I really enjoyed that one! It is great by itself and if you add a little bit of 'Celis Rasberry,' a Texas brewed, Belgian style wheat, it tastes awesome! I bought the Beer Club for my husband 4 years ago, and to this day, he's still a member! He renewed after my 6-month gift and still gets all excited each month when his box arrives. He's like a little kid. He'll invite his buddies over when he's feeling generous and insist that they try the latest from his shipment because they're always such a novelty. He really likes getting beers that he can't get in our local grocery store. Keep up the good work guys! I‘m going to send one of your E-Hints to him about the wine club for Mother's Day! Just wanted to drop you a line that my husband was initially skeptical about his Valentine's gift of the Beer of the Month club. Then the first shipment arrived and the man can't stop talking about it. He loves it, and is especially fond of the Alhambra Negra. He enjoys telling his friends about the new beers he is trying and also that it was a Valentine's gift from me. I must admit that I enjoy the way those men always look imploringly at their wives as if to say 'why didn't you think of that honey? 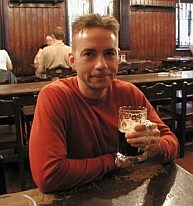 I've been a loyal member of your beer club since 1994 (wow, that's a long time!). I opened my December shipment this morning and dropped to my knees in joy when I saw Abita Christmas Ale in there. I went to college in New Orleans, and Abita is one of my favorites, but Christmas Ale is my all-time favorite beer ever, and I can only ever get it in New Orleans at Christmas time, which is tough since I live in California. Thanks very much! ...I just got my first shipment last week and tried some of the beers last night. I really loved both of the ones I tried very much...especially the Dogfish Head Chicory Stout! I'm a bit of a beer snob and joined the club with some hesitation because I really favor fuller-bodied ales. But you delivered in the first month with that one. It's really quite a beer. Very creamy and very robust. If you keep sending me beers like that one, I'll be a member for a long time. The Microbrewed Beer of the Month Club has long been one of our most popular clubs, and it’s all due to our focus on customer satisfaction and quality. The testimonials above from our satisfied customers show that we offer nothing but the best craft beer. Be sure to take a look at the reviews and customer-written testimonials on our five other monthly clubs options. Don’t forget that you can combine your beer club membership with any of our other subscription boxes with our Design Your Own Club™ program!